Foreign affairs hit closer to home more often than we think. And while our mental maps are expanding to allow for more serious examination of events at and near our southern border, it seems to me that the sheer number of World Affairs Council programs that focus on great powers and economies of Europe and Asia, or on the tribulations in the Middle East, significantly outnumber those having to do with the Western Hemisphere. Meanwhile, Alaska brings us greater awareness of the Arctic, while the other pole tends to be forgotten. Let’s try to change that. First, events in Venezuela rightfully demand our attention. Fifteen member states of the EU today joined earlier recognition by the U.S., Canada, and several Latin American nations of opposition chief Juan Guaidó as interim leader. Guaidó, the leader of the democratically elected national assembly, and President Nicolas Maduro both headed rival massive street protests in Caracas on Saturday. The stakes are high for Venezuelans, who have seen their once prosperous country descend into chaos, corruption, and poverty under Maduro, the socialist successor to Hugo Chavez, who died in 2013. While international diplomatic pressure and more stringent U.S. sanctions targeting the oil sector may squeeze the Maduro regime, they could also harm the people fighting it and fleeing from it. President Trump has not ruled out a “military option.” The geopolitical stakes are high, too, as Maduro has drawn support from Russia, China, and Turkey – portending much for great power rivalries and authoritarian challenges to democracy. As for what happens in Antarctica, it certainly won’t stay in Antarctica. The enormous cavity detected by scientists beneath the continent’s Thwaites Glacier will impact sea levels globally. Understanding the science, the impact of growing tourism, the nature of increasing Chinese interest, and the sustainability of marine resources are all worthy topics for Councils to cover. 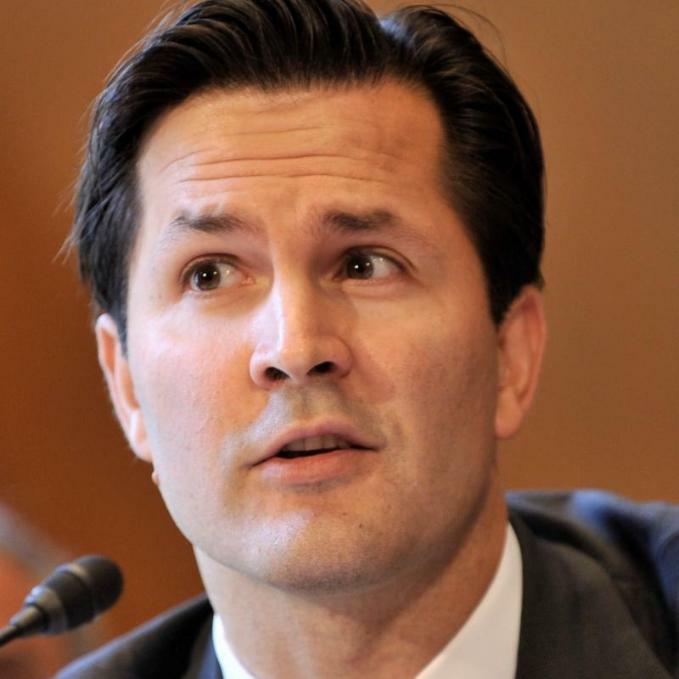 Congratulations to Tim Horgan, Executive Director of WAC NH, for his excellent leadership in chairing last month's Global Ties U.S. National Meeting, "The Exchange Effect." “It was a wonderful experience chairing the Global Ties National Meeting for 2019. It's always so great to get everyone, including many of our WACA friends, together for learning, sharing, and fun," said Horgan. Stay tuned for news about World Affairs Councils of New Hampshire - including their speaker series (like the The Future Without Nuclear Weapons on Feb. 6 with Dr. Lisbeth Gronlund) and film series (Finding Refuge: A Three-Part Film Series, beginning Feb. 27) - in a special Council of the Month block each week in February! Register now for WACA's Cover to Cover conference call on Wednesday, February 6, at 2:00-2:30 pm ET, featuring Thomas J. Bollyky, Senior Fellow for Global Health, Economics, and Development, Director of the Global Health Program, Council on Foreign Relations, on his new book, Plagues and the Paradox of Progress: Why the World Is Getting Healthier in Worrisome Ways. Plagues and parasites have played a central role in world affairs, shaping the evolution of the modern state, the growth of cities, and the disparate fortunes of national economies. This book tells that story, but it is not about the resurgence of pestilence. It is the story of its decline. Bollyky interweaves a historical narrative about the rise and fall of plagues in human societies with contemporary case studies of the consequences. Whether the peril or promise of that progress prevails, Bollyky explains, depends on what we do next. Read more by Bollyky in Foreign Affairs and Financial Times. The Foreign Policy Association's 15th annual Great Decisions Teachers Institute for high school educators affiliated with World Affairs Councils will take place June 24 through June 28 in New York City. Topics will include Global Migration, Nuclear Negotiations, and Trade with China. For the full list of topics and more information, please visit the Institute's webpage. To apply for the Great Decisions Teachers Institute, you must complete a questionnaire, which can be accessed by clicking here. High school educators nationwide are invited to apply by March 29. All applicants will be notified by April 12. 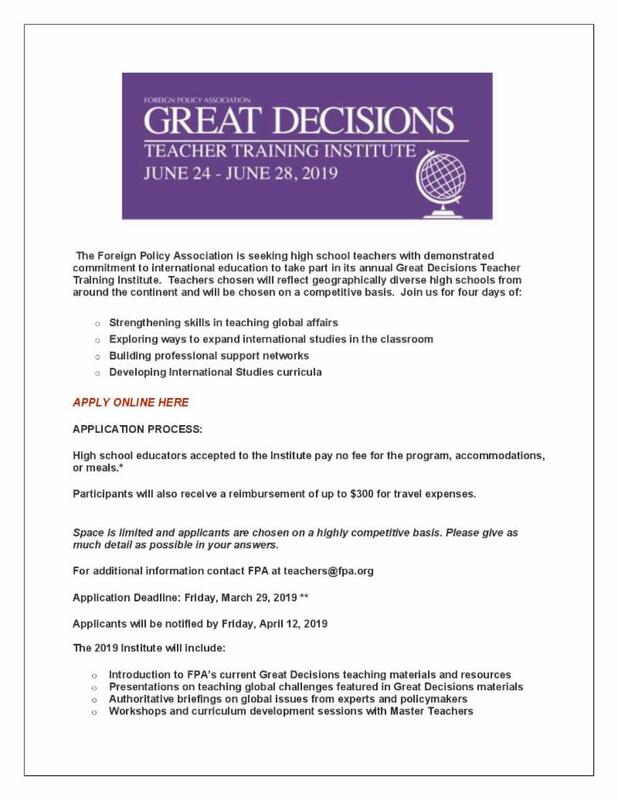 If you have any questions in regards to the application or the Great Decisions Teachers Institute, please email teachers@fpa.org, or call the Foreign Policy Association at 212-481-8100 x 249.